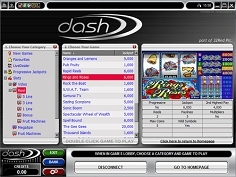 Dash Casino is a fresh and innovative online casino offering over 350 excellent games in a unique playing environment. It provides an excellent venue for Blackjack lovers to improve their game, with 35 great blackjack variations to choose from. They also have a great loyalty program, including an exclusive Silver Service level for top players. This excellent casino truly has it all! With Microgaming at the helm, the downladable game software at DashCasino takes you straight into a classic Vegas-style casino, bringing the best parts of the Vegas atmosphere right to your home computer. The suite uses today’s best high-resolution graphics and digital sounds to provide the most encompassing experience possible. The lobby looks great, and provides an easy way to find all your favorite games. Of course, you can play online as well, via the instant Flash-based casino. It’s not as impressive as the downloadable suite, but the trade off is ok, because it lets you play on any computer without having to install a thing! Dash Casino offers a great selection of the best Blackjack games available today. They have 35 titles to choose from, incuding: European Blackjack, Bonus Blackjack, Multi-hand Blackjack, Multi-hand Vegas Downtime Black jack, Multi-hand Vegas Strip Blackjack, Spanish Blackjack, Triple 7s Blackjack, Vegas Downtown Blackjack, Vegas Strip Blackjack, Atlantic City Blackjack, Flash Blackjack, High Limit Blackjack, Double Exposure Blackjack, Super Fun 21 Blackjack and Classic Blackjack, and many more. This selection not only covers all the most popular styles, but has a few extras thrown in too that you might not have played before! For a break from your blackjack winning streak at Dash Casino, why not try one of the other 300+ games they offer? The game selection ranges from Classic and Video Slots to Video Poker games through the best Table and Card Games like Sic Bo, Baccarat, Red Dog, and Roulette. There is even a strategy section online for many of their games, including some betting tables for blackjack to help you improve your game! There are also dozens progressive jackpots available for all players who want to try their luck in becoming an instant millionaire. 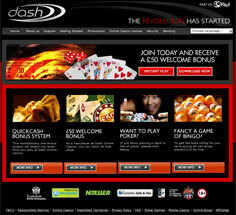 New players at DashCasino get a 100% match bonus on their first deposit, up to €/$/£50. Unfortunately for Blackjack players, all bonus money earned at Dash must be played through 30x, and Blackjack just counts 10% towards this, which ups the requirement to 300x (it’s even more for Classic Blackjack – 1500x). This makes bonuses not worth the effort if you play only blackjack. Do look into the loyalty program, however, as it can provide some extra cash, and look forward to Silver Service membership – an exclusive, high-level VIP Club only for Dash Casino’s best players. As far as blackjack is concerned, Dash Casino throws us a mixed bag. 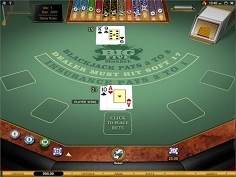 They offer lots of great variations on the game, and a lot of other good casino games as well, but the bonuses they offer are very hard to profit from by playing blackjack alone. This is another one of those casinos that works best if you play more than just blackjack.